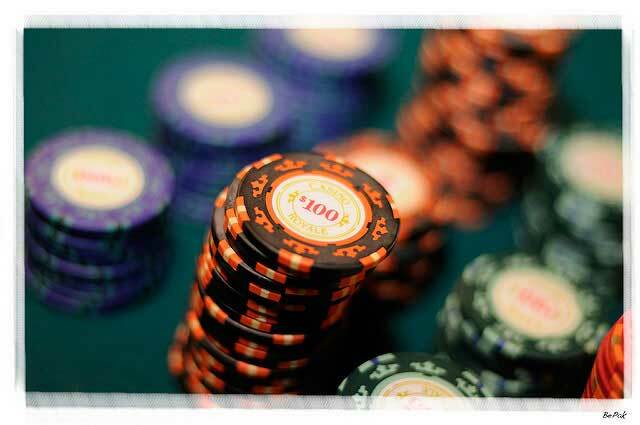 A cash game (also called a ring game) is a game in which your chips are equivalent to cash money. Unlike a tournament, in which you buy in for a set amount of chips and play until you lose all of those chips (or win a set amount based upon your rank in the tournament), in a cash game you can walk away at any point and cash your chips back in for money. String bets are not allowed. If a player does not announce a bet amount, then the player can not put chips in the pot and follow it with more chips in separate actions. In poker movies, you'll often see the hero say, "I'll call your $1000...and raise you $3000 more! ", and put the chip into the pot in two separate actions. This is forbidden in poker rooms and in this case it would be interpreted as only a call. A bet of a single chip is a call unless otherwise announced. Suppose it is $5 to call. If you throw out a single $25 chip, that is only a call, unless you say "raise". Don't worry, you'll get this one wrong a couple times before it sinks in. To be safe, it is always best to verbally announce your intention to raise. Dead button rule. No player may miss the big blind because another player has left the table. The decision of the floor manager is final. When not covered by these rules, standard tournament poker rules will be enforced to the best of the ability of the floor manager. If there is no waiting list, you may select any open seat you like unless tables are significantly unbalanced, in which case the floor (a kind of manager for the cash tables) will direct you to a table that needs more players. If you end up not liking your table, and seats are available elsewhere you can request to move and this will be most often be allowed if it is not creating too much a table imbalance. Cash games have a set blind structure: unlike tournaments, where the blind structure increases over time, (e.g., a $1/$2 cash table will always stay at $1/$2). Having said that, aggressive players will sometimes up the ante by “straddling” the big blind. A straddle is when the Under the Gun player doubles the big blind before the cards are dealt. There are other forms of blind re-raises that you will see occasionally, but the straddle is the most common. There are minimum and maximum limits on the amount of money you can bring to the table. A typical $1/$2 table might allow a minimum of $60 and a maximum of $300. If you win big, you can obviously have much more than $300 in front of you, but you may not add more than brings you to $300 yourself. You may not remove money from the table at any point. If you have won $1,000 and want to protect some of that profit, you must leave the table with your entire stack. You can not just remove $500 from the table and remain in your seat. Absent players. Unlike tournaments, an absent player is not dealt a hand. If a player is away from the table and misses either or both of their blinds, they must pay the blinds when they return. If they are away for multiple rounds of blinds they only pay one. Unlike tournament poker, neither player is forced to turn his/her hand face up immediately when an all-in and call is made before the river. After the last card is shown, the player who went all-in and was called shows their hand. If the player who called cannot beat that hand, she may muck her hand without showing. In some cardrooms, players may ask to see the cards and then the hand would be revealed, but that is generally not done, and even if allowed, considered bad form. In Limit poker, there are proscribed limits on betting in each round. A limit game will have a small bet and big bet (say $2 and $4). The big blind is the size of the small bet (and the small blind is less than that). If you are the first to bet, you can only increment the bet by the size of the small bet. The next player can also only increase the bet by the size of the big blind. So, if you are at a $1/$2 limit table, the first better can only raise to $4 ($2 plus another $2). The next player who would like to raise can raise to $6 ($4 plus $2). These limits are true for the flop as well. On the turn and river you must bet the size of the big bet. So in this example you could open the turn betting with $4 and the next raiser could go to $8. However, there will also be a cap on the number of raises which can be made (usually 4 or 5, but varies by casino). Once that number of raises have been made, no more raising can occur. In Pot Limit poker your bet is limited by the amount of money in the pot at the time of your bet. Your legal bet size is thus anywhere between the big blind and the size of the current pot. In No Limit poker you can bet all of your chips at any point. The minimum raise is the amount of the previous raise (or the big blind if there has been no prior raise). No Limit is currently the most popular form of Texas Hold'em being played at casinos. However, you will often find a couple of tables of Limit players if the cardroom is large enough. Pot limit is extremely rare in Hold'em, but is the most popular form of Omaha being played today.